The performer sits sidesaddle, preparing to execute a spectacular stunt—to stand on a horse as it gallops around the ring, and dive through a paper hoop. We feel the excitement and anticipation as she speeds around the arena, her face isolated against the sweeping background. In the stands, a single top-hatted observer looks on, emerging almost grotesquely from a sea of blurred, vibrating motion. The rider's daring act was a central attraction of the circus Fernando in Paris, often featured on posters and handbills. Here, it is recorded by the artist and caricaturist Henri de Toulouse-Lautrec. It was one of his first attempts to incorporate new, modern subjects into a composition that he intended not as an illustration or sketch, but as an independent work of art. An enthusiastic observer of contemporary culture, Lautrec found the momentous in the commonplace, fusing the colorful performances and noisy atmosphere of the circus into a single animated gesture. A student of Degas and a superb draftsman, he quickly mastered the pastel process, working in a spontaneous, rapid style. Here, he emphasizes the sweeping movement of the rider with soft focus and startling colors—notice his use of lavender, and the myriad different colors on the horse. The picture is inscribed in the upper right "a mon ami Brua,” to my friend Brua. Aristide Bruant—his proper name—was an entertainer and bar owner known for his bawdy songs and his habit of insulting customers. Lautrec, who had a permanent table at his establishment, credited Bruant as the first to exhibit his art. Did you think the circus was just for kids? Well in Paris in the late 1800s, the circus was a favorite spot for grownups—especially artists! They loved the noise and the color, the animal smells and off-beat clowns and daredevils. 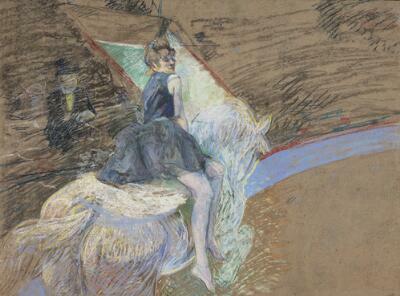 And Toulouse-Lautrec, who loved painting in Paris, was no exception. He made this circus drawing on brown paperboard—which is kind of like cardboard—and he left it showing for the brown background—instead of covering it over with color. He used pastels—a kind of oily chalk—to get that soft focus, and a sense of the rider moving around the ring. We can’t even make out the face of the one man seated in the stands. And take a careful look…How many colors can you find in the horse’s “white” coat? Also, by cutting things off the way he does, Toulouse-Lautrec makes us part of the circus—as if the ring comes right out into our space and the horse just galloped by us! How do you think the rider feels about the trick she’s about to do? Is she scared? Bored? Excited? Will she succeed? Or is she in danger of falling? Next time you go to the circus, pick something, and try sketching what you see.